Why don’t people listen to your advice? Last week, Shay Rowbottom posted a video about a friend who asked her for advice… but didn’t follow it. Shay was frustrated because she knew what was good for this friend… but the friend couldn’t see it for herself. Anyone in the business of selling advice has been in this position before. You know what’s good for a prospect or client, but there’s something preventing them from acting on your advice. That something is called a “cognitive frame”. A cognitive frame is a lens through which you see the world. It acts like a gatekeeper. Ideas that don’t fit with our cognitive frames get rejected. And only ideas that are aligned with our cognitive frames are allowed in. It might not be that they disagree. It might just be that they have the wrong cognitive frame. Don’t hammer them over the head with it. Because you can’t force your way through the wrong cognitive frame. 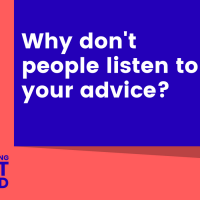 Any examples of how you’ve changed someone’s cognitive frame and got them to listen to your advice?